Sew what's cooking with Joan! 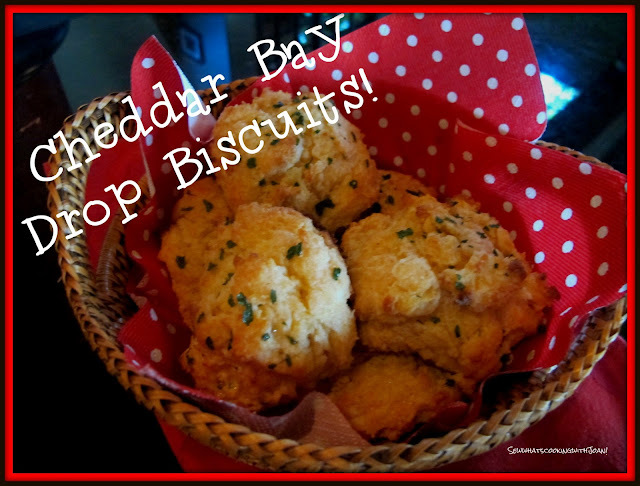 : Cheddar Bay Biscuits! Red Lobster and Hike Week! Last week was Mom's 93rd Birthday! She wanted to go to Red Lobster to have Coconut Shrimp. So, we picked up my daughter, Holly, Mom and off we went! 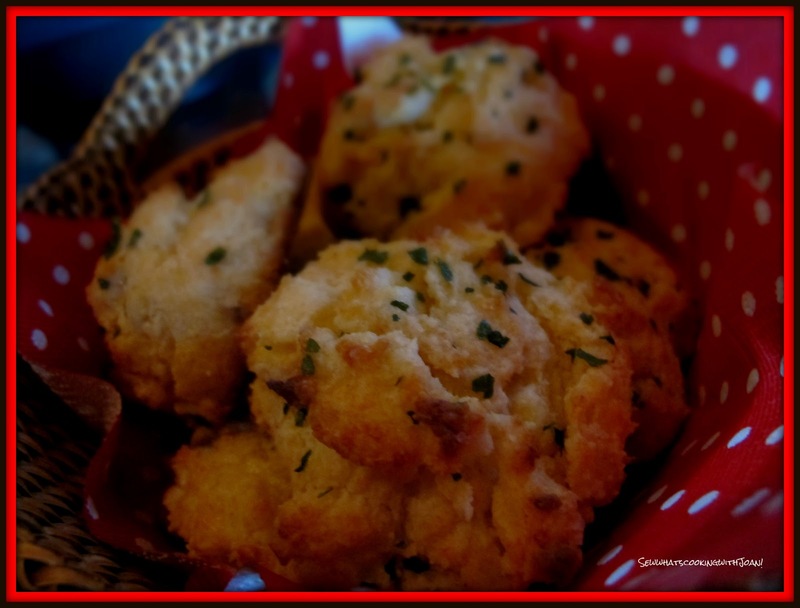 Red Lobster is America's largest Seafood restaurant chain and if you order an entree, you will get a basket of this planet's most delicious garlic cheesy biscuits served to you on the side. Mom ordered her favorite "Coconut Shrimp" and started with a bowl of clam chowder. She went through a few biscuits and told us to hide the one left in the basket.....What? The waitress picked right up on what Mom wanted, and said, "just take the biscuit....I'll bring you another basket!" So, her love for these cheesy biscuits started a conversation and I committed to make her a batch for the upcoming barbeque at her house. I had researched these biscuits once before and knew there are a hundred recipes on the internet purporting to be Red Lobster's Cheddar Biscuits. I have tried a few and wasn’t completely impressed. Something was off. They’re all over the place on the internet–just put “Red Lobster biscuits” in your search engine and you'll see. Now, in the recipe I'm giving you, I used Bisquick, but, you can make your own baking mix, if you want. 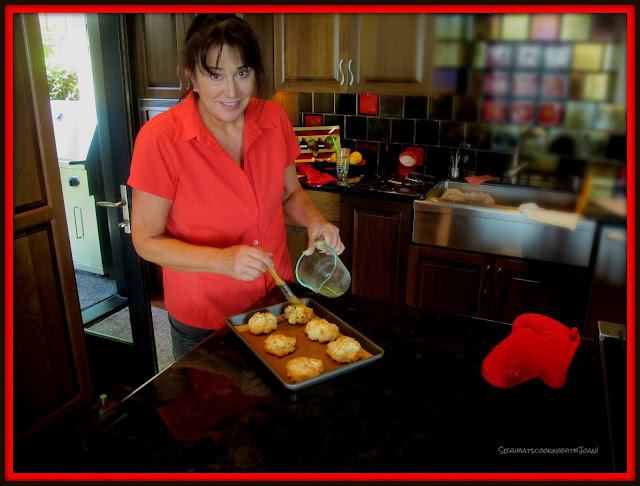 However, after much research, the ingredient I found that gave these biscuits their punch....."Cayenne Pepper"! All the recipes I found did not use Cayenne. This is the indefinable zing to the biscuits that is missing in all the knock off recipes I found on the internet. These are delicious and if you are having a barbeque this week, or you are invited to a 4th of July picnic, take these, you will be the hero! Oh, and by the way, Mom took the basket of biscuits home!! She definitely loves these biscuits! 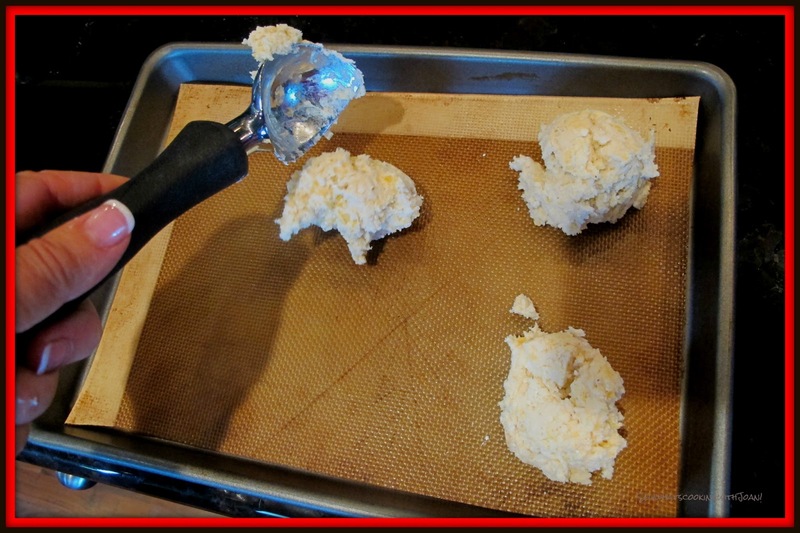 Preheat oven to 400 F. combine Bisquick, with cold butter in a medium bowl using a pastry cutter or a fork. Don't get over zealous in the mixing, you don't want it thoroughly mixed. There should be small chunks of butter in there that about the size of peas. 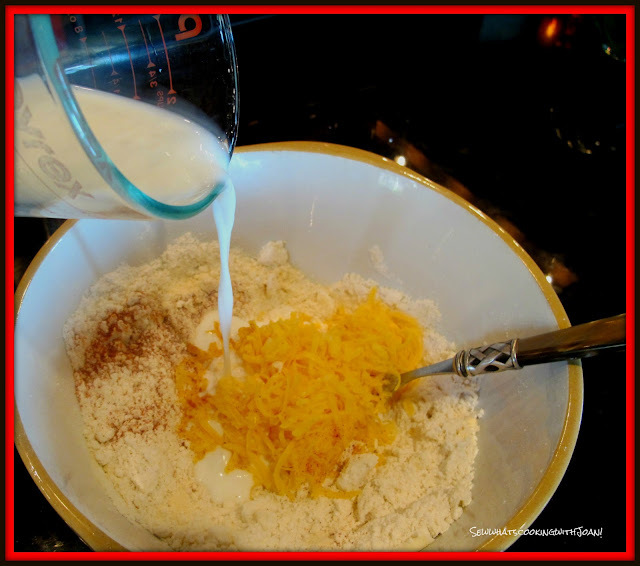 Add cheese, milk, garlic powder and cayenne. mix by hand just until combined....don't over mix! Drop approximately 1/4 cup portions of the dough onto an ungreased or you may use a Silpat, as I did, cookie sheet using a ice cream scoop. Bake for 15 minutes or until the tops of biscuits are light brown. Hike Week is here! This Summer we are having two weeks! One in June and one in late August or early September. My daughter who has been instrumental in helping organize our hikes each Summer, is pregnant.....very pregnant! 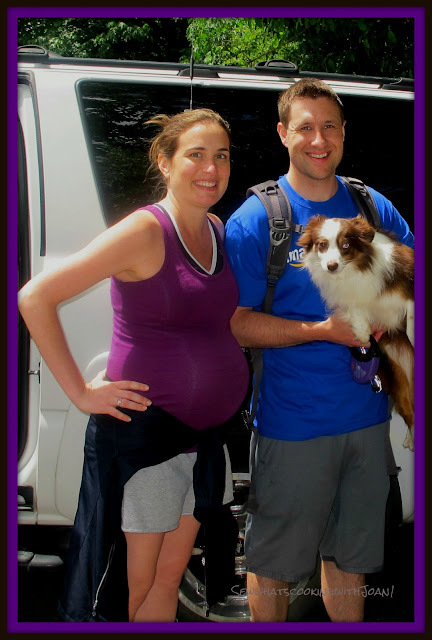 She didn't think she could hike in June, so I said we will do September instead, but, my loving niece Allie wanted one in June, because she just had her baby son Ryder. She believes these annual hikes with Aunt Joan get her back in shape after the Winter, and they do! Also, my niece's Sarah and Stephanie wanted to join in when not working. So, we are having two hike weeks! It works out perfect for me, as it off sets all the time I am spending sitting at my sewing machine making quilts for all the babies! Our first hike was last Saturday. 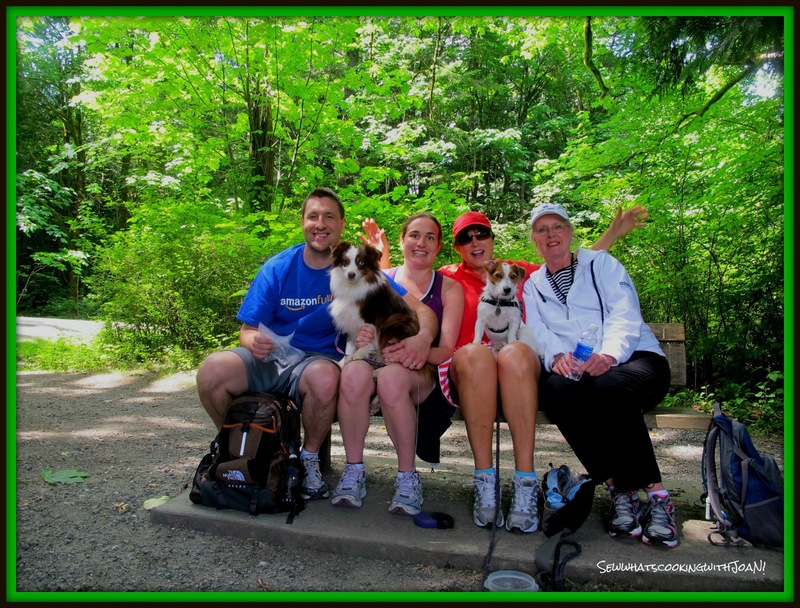 We did 8 miles on the Preston Snoqualmie Trail. 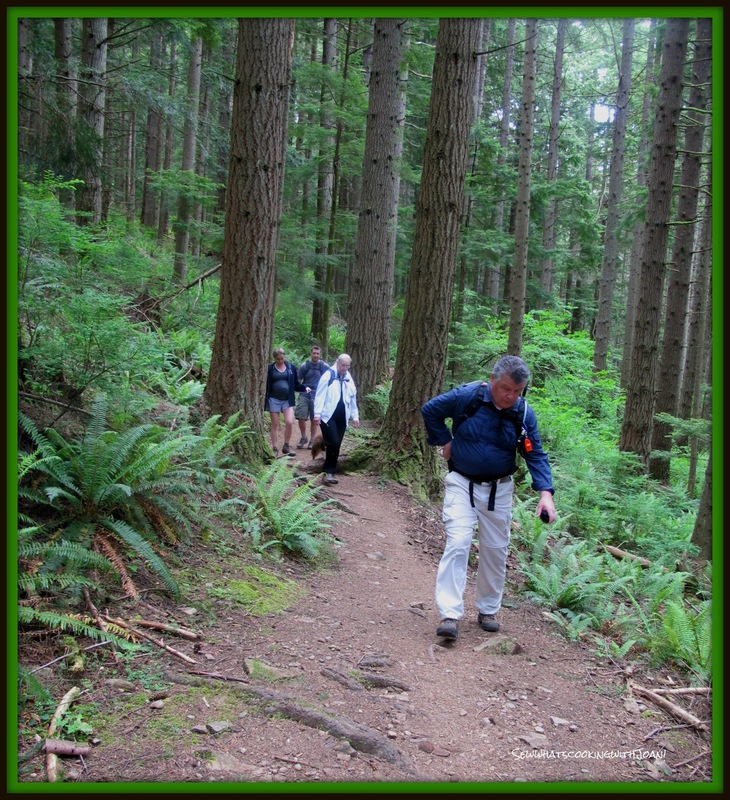 It is a fairly flat trail, bike and family friendly. The end has several picnic tables a few benches and a peek-a-boo view of Snoqualmie Falls. The view would be much improved in the Winter months. Preston Snoqualme trail It is a 12 mile out and back from the parking lot in Preston, which isn't written clearly in the notes. You can park at Lake Alice for a shorter hike, approximately 4 miles. Holly and Nate ended up joining in on Saturday and Sunday's hikes, as they were moderate. She did great! My long time friend Jane enjoyed the hike too! And two pups Emma and Bandit. Day two hike was Tiger Mountain Trail (TMT), we did about 7 miles. Long time Friends Jim and Jane, Holly and Nate. 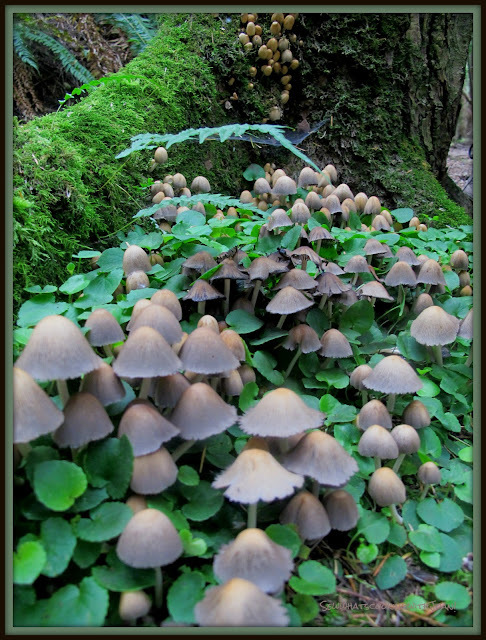 We happened upon this photo opportunity, the flora and fauna, isn't this beautiful? Hike week continues through Wednesday this week, my nieces are joining in on the fun starting today. Later this week, Wee Bear and I are off to Vegas! We are Matron of Honor and Best man at our friends surprise wedding! Our good friend has made a reservation at a restaurant he has wanted me to experience in Vegas. 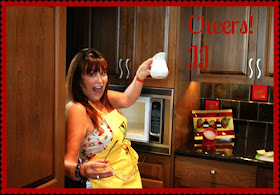 I am thinking it will be blog worthy!! Amy will be back blogging on Friday! Our Aunt is everything you read here and a thousand times more! She has done it all, and does it well! We love her! Thanks for commenting!they are delicious!